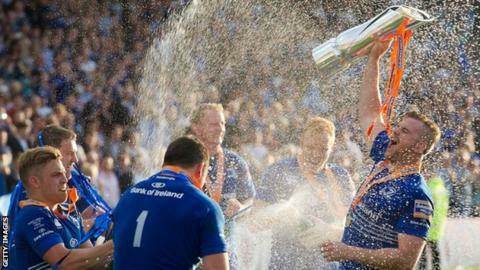 Pro12 2015: Who needs to do what in the final month? With two rounds of matches remaining in the Pro12, BBC Sport takes a look at who needs to do what in the race for the title and European Champions' Cup qualification. It is two races for the price of one, with the additional attraction of two Welsh regions battling to avoid being the lowest ranked team in their country, with nothing at stake other than pride. Last season saw Leinster claim the title for the fourth time in Brian O'Driscoll's final game. This season's climax looks like being just as exciting with the top four teams separated by just four points and the new qualifying rules for European competition mean there's plenty as stake right down to eighth place. There's no question which teams will make the play-off semi finals on 23 May. Glasgow, Munster, Ulster and Ospreys will finish as the top four teams in the table with Leinster out of the running after their 26-10 defeat by Ulster. But there will be a battle royal to decide who finishes first and second to get a home draw in the play-offs, with the top four separated by only four points. Ulster face the toughest run-in, with away matches against rivals Munster and Glasgow. The Scots also face a trip to Ospreys. Munster are home to Newport Gwent Dragons in the final round of regular season matches on Saturday, May 16, when all the games kick off at 15:00 BST. Ospreys could find themselves needing to beat Connacht in Galway to secure a home draw. The top four sides have already qualified for the European Champions' Cup, and discounting the place in the tournament reserved for an Italian team, there are two automatic qualification slots up for grabs. Leinster are in pole position to finish in fifth place, with a home match against Treviso to come. Sixth place appears to be a scrap between Scarlets, Edinburgh and Connacht. Missing out on sixth spot might not be the end of the Champions' Cup road either, with the seventh-placed team entering a play-off against the seventh-placed side in the Aviva Premiership. Home advantage will be decided by a toss of the coin with match winners facing the seventh-placed team from the French Top 14 on May 30 for the right to play in the Champions' Cup. Edinburgh face Gloucester in the final of the second-tier Challenge Cup competition on Friday evening, but victory in this tournament no longer carries the reward of a place in the Champions' Cup. Then: The next three highest-placed teams in the table. Plus: The next highest-placed team to enter a play-off with the seventh-placed team in England's Aviva Premiership for the right to play the seventh-highest team in France's Top 14 for a place in the Champions' Cup. The impact of the new qualification criteria for the Champions' Cup has been immediate. On the plus side it means that the teams between fifth and eighth places in the table still have a lot to play for going into the final two weeks of the scheduled season. There are no dead games, and players cannot afford to think about the beach or World Cup preparations until the final ball is kicked. The other side of that coin is that Wales and Scotland are in danger of having only one team in Europe's top-flight tournament next season. Scarlets have a one-point advantage over Edinburgh, while Connacht's heavy home defeat by Glasgow leaves them five points behind the Welsh region with games at Zebre and at home to Ospreys to finish. It favours the Scarlets, who are home to Cardiff Blues and away to Treviso in their final matches. It seems unlikely at this point, but an inspired finish by Connacht and an implosion by the Welsh and Scottish pair could see Ireland have all four of their provinces playing in the Champions' Cup next season. Benetton Treviso and Zebre are the bottom two sides in the Pro12 table, but one of them will play in the Champions' Cup with each of the four nations participating in the Pro12 guaranteed at least one team in Europe's top-flight tournament. Treviso are three points ahead of their compatriots, with games to come against Leinster and Scarlets. Zebre are home to Connacht and away to Cardiff Blues. The Blues and the Dragons are the only teams who cannot now qualify for the Champions Cup - even though they are well ahead of the two Italian sides in the table. Cardiff Blues are the lowest placed of the four Welsh regions, with Newport Gwent Dragons able to secure their place above them provided they do well against Edinburgh or Munster in their final two games. The Blues face a tough trip to Scarlets followed by a home match against Zebre, who won at the Arms Park last season and who might have the motivation of European qualification to play for.